12 hours of Fairtrade campaigning and celebrating! I always love Fair Trade Way walks. The spring in your step as you walk through beautiful countryside always gets springier with the solidarity of your fellow fairtrade walkers! But this one was particularly good! From fuelling up with Fairtrade drinks in i-smooth at 9am, and schools gathering outside Ammanford Co-Op for a sing-song send off at 9.30, through to 9.30 at night and us collapsed in Carmarthen’s King Street outside the Co-Op and inside Oxfam, chatting to people in the pub next door about what we were doing… Twelve hours-plus of determined but fun-filled Fairtrade campaigning! Ysgol Bro Banw sang the song they’re entering in the Fair Trade Wales Fairtrade Song Competition, accompanied by Ammanford Nursery on home made shakers, and after lots of photo opportunity posing we were on our way… 38 humans and one dog! Up to the Gorsedd, then another photo opportunity at the “Welcome To Ammanford” sign. Time to make sure everyone had water (plenty available thanks to kind donations from the Co-Op and Menter Bro Dinefwr), and then on, out of Ammanford over the boundary-marking bridge, and off the road onto a footpath and our first sight of a Fair Trade Way waymarker! On along paths, roads, tracks and hills to Trap. And a lovely welcome (especially considering we were pushing their patience by arriving an hour and a half later than planned!) at Trap Village Hall. KITe’s community film workshop people interviewed us while the community cafe volunteers gave us endless supplies of tea and toast! Then off again, along more pretty paths and back roads (and a very big puddle of mud!) towards Llandeilo. Amazing views along the valley showing the long route ahead… Paxton’s Tower a long way away… and that’s not even the end of our route! One of the highlights of the day was definitely walking along the banks of the Towy below the railway station and hearing the sound of Llandeilo Primary School’s samba band drifting all the way down to us. The samba rhythms pulled us up the hill to their school allotments where they entertained us while we re-fueled with more water and lunch from our rucksacks or the Co-Op. Some walkers said goodbye here and got the bus back to Ammanford. The rest of us continued on through Dinefwr’s beautiful wildflower meadows and on towards Dryslwyn. And more views of Paxton’s Tower… getting bigger! We should have gone down by Aberglasney, but due to us being way behind schedule at this point, we took a short cut through a top road to Broad Oak, where the students from Amman Valley School had to catch their mini bus back. Some were gutted they didn’t have time to finish the full walk. Others were happy to get a lift while they still had some skin left on their heels! But all were fine young standard bearers of Ammanford’s Fairtrade Future! It was hard to leave Dryslwyn. A lovely Fairtrade shop and cafe run by lovely volunteers with an endless supply of water, tea, fairtrade cookies and ice cream… or a long hard trek over the last eight miles to Carmarthen? It was very hard to leave… especially for the people getting their feet massaged with Fairtrade Foot Cream donated by LUSH!! We had worked out several paths to help us avoid using busy road routes, but the roads were the straightest routes and therefore the most popular with tiring walkers! Paxton’s Tower was now behind us, and, as the sun began to go down and bird song became louder than traffic noise we finally came towards the end of our marathon ramble… And King Street, Carmarthen was filled with tired bodies and celebratory drinks. Tired bodies but happy people. A proper sense of achievement and a proud realisation of a fantastic day’s awareness raising for Fairtrade. 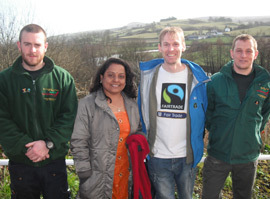 I was invited by my friend Katherine Eilbeck to do a Fair Trade walk from Ammanford to Llandeilo. I met Kath, and about 38 other walkers in the Co-Operative car park, in A’ford, where there were also three groups of school children, entertaining us with the singing of their Fair Trade song. We left there a little after 10am, to the flashing of cameras, down lanes and over fields, with brilliant views of Carreg Cennen Castle at one point, and into the lovely village of Trapp. The ladies of the village provided us with Fair Trade tea, toast, biscuits and cookies. Thank you all so much. Onward and upward until sometime in the afternoon Llandeilo came into view in the distance…what a pretty sight. As we wound our way through the back streets of the town we could hear the sound of a Samba band……and, on arrival at the little green by the Co-Op car park, there was another group of local school children, playing those drums to greet us… and they played magnificently. The young lady from Fair Trade Wales, who had driven between stops throughout the day, providing us with free water, was there cheering us in and then feeding us with bananas, ice cream and also giving us all little pots of soothing fairtrade foot cream for our tired tooties. Back to A’ford on the 4.05 bus…but many of those walkers carried on by foot to Carmarthen. A wonderful day of walking, friendship and Fair Trade food. Thanks again to Katherine Eilbeck, and Phil from Oxfam, who organised the route, to all those schools and their pupils for their support, and the ladies of Trapp. If a Fair Tade Walk is planned for your area…go for it…you’ll enjoy.